Comprising timeless staples, modern silhouettes and sophisticated details, Bonmarché’s new collection has a rich palette of autumnal colours and warm tones throughout. Layering pieces is key for autumn and Bonmarché has plenty of options to indulge in, from chunky knits and super-soft ponchos to padded jackets to keep you warm and cosy without compromising on style. The all-new Edit by Mark Heyes is now available and features figure-flattering designs in bold stripe prints that will bring an on-trend update to your wardrobe. The Bonmarché collection is available in sizes 10-24 and shopping with the retailer has never been easier – visit one of its 300-plus stores nationwide, go online at bonmarche.co.uk or call the order line on 0330 026 2728. Once you’ve decided what you would like, quote the code 20CANDIS at the checkout to receive 20 per cent off when you spend £25 or more. This VOUCHER entitles the bearer to 20% off when you spend £25 or more in-store, online at bonmarche.co.uk or via the telephone order line on 0330 026 2728. 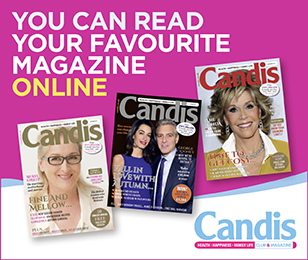 Online and telephone order line customers enter 20CANDIS at the checkout. Offer valid until 31 October 2018. Terms and conditions: This voucher cannot be used in conjunction with any other discount voucher, offer, code or sale items. Not valid on the purchase of gift vouchers/cards. Photocopied, damaged or defaced vouchers will not be accepted. The cash redemption value of this voucher is 0.001p. Discount may be used only once.